Crumb bars. Pie bars. Crumble bars. 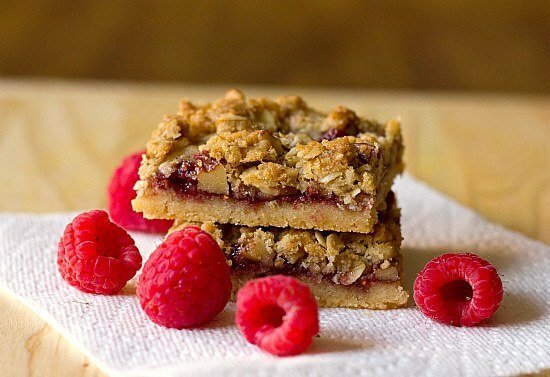 Streusel bars. God I love summer. All of the fruit. And pies. And tarts. And buttery, flaky, streusel-y bars like these. It’s my personal warm-weather heaven. And I embrace every single fruity second of it until the air starts to cool and the leaves begin to change. When I took the raspberries out of their container in anticipation of making these I marveled at how my baking habits drastically change with the seasons. During the winter it is pretty much all chocolate, all butter, all of the time. Now to be fair, these bars certainly have their fair share of butter in them. But once the weather starts to turn, a transformation takes place in my kitchen. 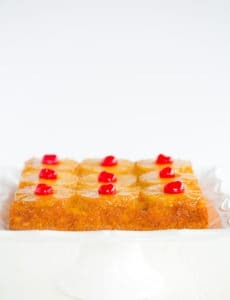 It becomes brighter, more colorful, and the baked goods tend to be lighter, and there is definitely more fruit involved. 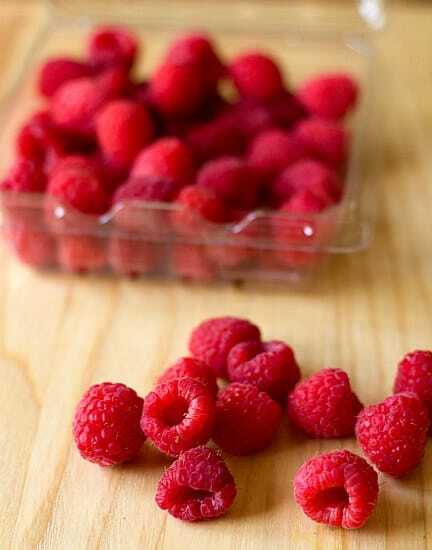 Fruit like these raspberries. Aren’t they some of the most beautiful, perfect raspberries you’ve ever seen? The other thing about warm weather is that I like to be out enjoying it, and not in the kitchen all the live long day. 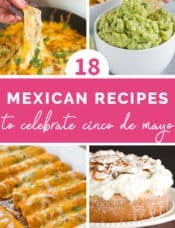 So once summer rolls around I definitely trend towards recipes that are quick and easy to throw together and don’t require to linger in a kitchen with the oven running for hours on end. These bars absolutely fit that requirement. In about an hour you can have these in and out of the oven and let them cool while you run barefoot through the grass. Then come back inside, cut them up, and enjoy. 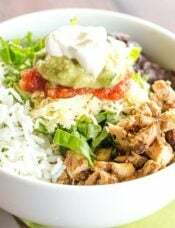 You did just burn off a ton of calories running through the grass, right?! 1. 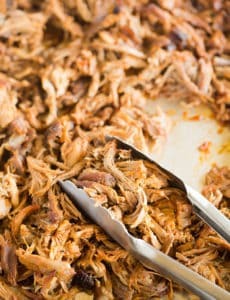 Preheat the oven to 375 degrees F. Line a 9x13-inch pan with foil so it hands over the edges. Spray the foil-lined pan with nonstick cooking spray. 3. Measure 1¼ cups flour mixture into a medium bowl and set aside; distribute the remaining flour mixture evenly in the bottom of the prepared baking pan. 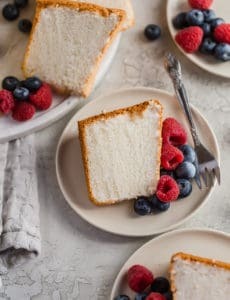 Using your fingers or the bottom of a measuring cup, firmly press the mixture into an even layer to form the bottom crust. 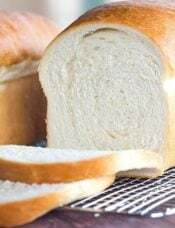 Bake until the edges begin to brown, 14 to 18 minutes. 4. While the crust is baking, add brown sugar, oats, and nuts to the reserved flour mixture; toss to combine. 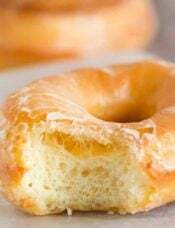 Work in the remaining 2 tablespoons of butter by rubbing the mixture between your fingers until the butter is fully incorporated. Pinch the mixture with fingers to create hazelnut-sized clumps; set streusel aside. 5. Combine preserves, raspberries, and lemon juice in a small bowl; mash with a fork until combined but some berry pieces remain. 6. Spread the filling evenly over the hot crust; sprinkle the streusel topping evenly over the filling (do not press streusel into filling). Return the pan to the oven and bake until the topping is a deep goldne brown and the filling is bubbling, 22 to 25 minutes. Cool to room temperature on a wire rack, 1 to 2 hours; remove from the baking an by lifting the foil extensions. Cut into squares and serve. The bars can be stored in an airtight container at room temperature. *Note #1: Frozen raspberries can be substituted for fresh; be sure to defrost them before combining with the raspberry preserves. 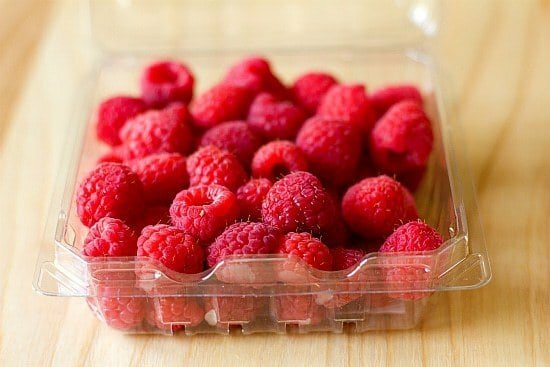 *Note #2: If your fresh raspberries are very tart, add only 1 or 2 teaspoons of lemon juice to the filling. Hi Barbara, So glad you enjoy them! Yes, they can be frozen! I made these for Easter this weekend and they were a huge hit. They’re super easy to make and taste amazing. I will be making these over and over again! Hi Diane – your comment was a long time ago so I’m hoping you got an answer to your question about the jam/jelly/preserve measurement… but just in case you didn’t… When you say that 8 oz = 1 cup, that is a liquid (fluid) measure you’re thinking about (as opposed to a dry measure which is by weight). So this would be ingredients like water or milk that have much less density than a jam or jelly. So for this bar recipe, Michelle is giving you the approximate equivalents in volume and weight for some of the ingredients. When a recipe doesn’t specify fluid ounces, I use the guideline “is the ingredient ‘like’ water?” to decide whether I should be using a liquid measure or a dry measure. For example, apple juice would be “like” water (use liquid) but mayonnaise would not be (use dry). Hope this helps. Found this bar recipe last year. Have made this at least 30 times in CT and FL. As a result of the inspiration from this recipe, started making my own raspberry jam – store in freezer and use when I make these delectable goodies. There’s not a person who doesn’t love them – doesn’t matter what season I make them with raspberries available all year round now. It’s personally one of my favorite goodies – if I’m going to splurge with calories, it will be on this bar. 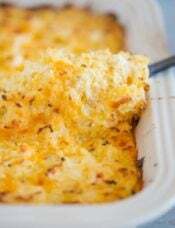 Lovely recipe that exudes warmth and caring. Yum! PS: Make jam with raspberries, blackberries, blueberries, and strawberries which adds a whole new element to the dessert. I made these tonight, and they turned out great! I always have trouble cutting bar cookies, but these sliced up beautifully. The only change I made was to add about a half teaspoon of almond extract to the raspberries, merely because that’s a flavor I like with fruit. Thank you so much for posting this! So glad I stumbled onto your blog. These are simply delicious! I made a batch for an Indy 500 party and they were gone before the race was over. I made another batch a few days later and once again, they were gone w/i a day. My mom, who doesn’t typically like fruity things, absolutely loves them. Not only were they a huge hit, they’re so easy and quick to make. To me, they taste like thumbprint cookies. This is a recipe that has already found a home in my recipe book. You tweak my heart with this because raspberries are my favorite recipe. 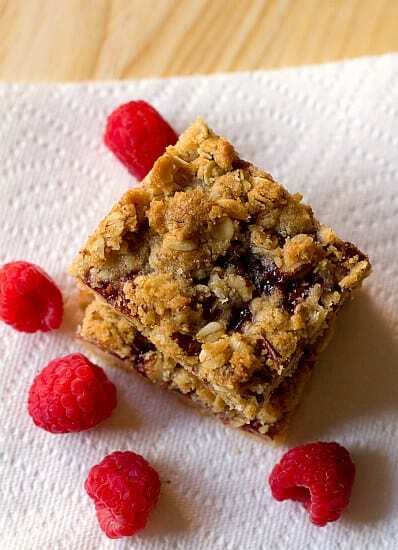 Most of the streusel bars I see only use preserves so I loved seeing the fresh berries included. Many thanks! Those look heavenly. I am with you, the fruits of summer make me wild with excitement! My baking habits definitely change in the summer too. I think with me it as a lot to do with the quality of fresh fruit. 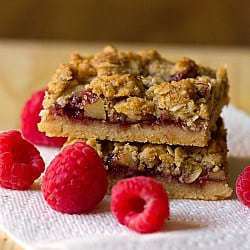 The raspberry streusel bars look so yummy! These look so good! I’m a sucker for anything with a streusel-crumb topping. I am defenseless against crumble bars! Everytime I see one I have to eat it! This looks awesome I love that you use fresh fruit in it too. I also love picking berries and can’t wait to start. These bars look amazing. 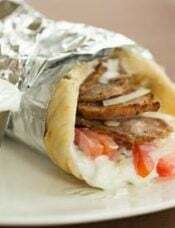 I want a dozen, right now! I just KNOW I wouldn’t be able to stop at one, or two, or even three if I had to start eating these! They are perfectly scrumptious! I almost did a happy dance in Costco today when I saw they finally had raspberries. Looks like their timing was great because now I can try making these bars. I hear you about transitioning from chocolate to fruit desserts. These look like the perfect way to welcome in the season.